MEMOFIN - What Are Corporate Bonds ? - L'information financière que vous ne trouvez nulle part ailleurs ! What Are Corporate Bonds ? The SEC’s Office of Investor Education and Advocacy is issuing this Investor Bulletin to offer basic information about corporate bonds. What is a corporate bond ? 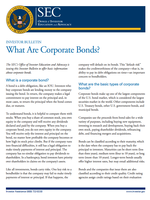 What are the basic types of corporate bonds ? What happens if a company goes into bankruptcy ? What are the financial terms of a bond ? What’s the relationship among bond prices, interest rates and yield ? What are some of the risks of corporate bonds ? How can investors reduce their risks ? How do I research my bond or bond fund investment ?